To ensure voters receive their ballots when they are first mailed out the week of October 17, the Mesa County Elections office is recommending that any changes to a voter’s registration record should be done by Sunday, September 25. If a voter is unsure if their information is up-to-date, or if they’d like to update their information, they may contact or visit the Elections office at 200 S Spruce St, Grand Junction or visit the Secretary of State’s voter registration website at GoVoteColorado.com. 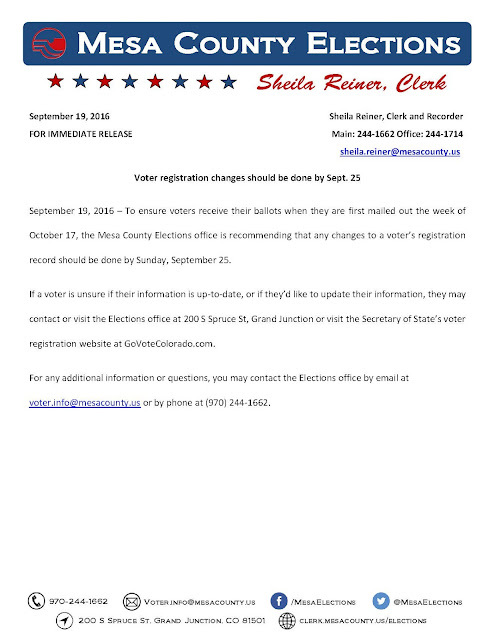 For any additional information or questions, you may contact the Elections office by email at voter.info@mesacounty.us or by phone at (970) 244-1662.